Pay a visit to the Lake Palace and you are bound to return completely drunk on its beauty! Lake Palace of Udaipur is poetry written in white marble. The mere sight of the palace envelops you in romantic feelings. May be this is the reason why its visitors address it as the most romantic palace of the world. It is tucked away in azure waters of the equally romantic Lake Pichola. The palace is built on the Jag Niwas Island. The Lake Palace was built by Maharana Jagat Singh in 1743 to escape from the scorching heat of summers. Now it has been transformed into a heritage hotel by the Taj Group Of Hotels. The five-star heritage hotel makes Udaipur a five-star destination. The hotel is a perfect place to experience royalty in abundance. It provides all the modern facilities for your comfortable and pleasurable stay. The beautiful hills on one side of the Lake Palace give the palace a fairy-tale look. Its balconies give panoramic views of the towering palaces present in its surroundings. Originally the palace was given the title of Jag Niwas after the name of the Maharana, but later it was renamed as Lake Palace. The exterior of the palace leaves you craving for experiencing the beauty of its interiors. And the pleasure that you attain after exploring the interiors takes you to heaven. Lake Palace is the brightest architectural gem in the necklace of Rajasthan. It is an aggregation of several rooms which have been named according to their beauty and purpose such as Bada Mahal, Khush Mahal, Ajjan Niwas, Phool Mahal and Dhola Mahal. Stroll in these royal apartments and you will be rewarded with beautifully carved arches, vivid paintings, shimmering crystal work, stained glass work and inland stones of green and pink lotus leaves. The courtyards, gardens, balconies, corridors and terraces contribute their own bit to the beauty of the palace. 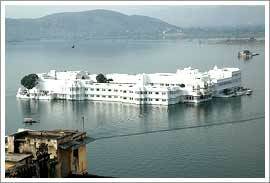 Lake Palace hotel boasts of well appointed rooms which are 83 in number. They can be categorized into 17 suites and 53 deluxe rooms. The rooms are decorated in a royal style depicting the traditional textiles, miniature paintings,glass work and handicrafts of the state. The lake facing rooms really drag you into romantic mood. The room facilities include AC, TV with satellite channels,running hot and cold water,round the clock room service, telephone with international dialing facility, and laundry/dry clean service. The royal banquet rooms where the royal celebrations and feasts were hosted by the Maharajas have now been transformed into reception rooms, bars, restaurants and coffee shop. There are 8 meeting rooms which are well equipped with modern facilities such as Internet service, sprint mail, computer, laptops, printers, cellphones, color copier, secretarial service and translation facility. A stay at Lake Palace Heritage Hotel is a royal experience to the hilt.